China foreign expats now earning $3,000 a week without teaching TEFL nor ESL and making many new Chinese friends! Subject: China foreign expats now earning $3,000 a week without teaching TEFL nor ESL and making many new Chinese friends! But when scams start affecting innocent Chinese school children the Chinese parents are quick to become outraged, especially when they learn that the "American TEFL teacher" they pay $100 an hour to teach junior is really a fugitive from Serbia who never taught anything in their life before coming to China. Two years ago a mother was horrified when one of these fake teachers sent her an email saying that her child "had bad gramer problems" that he wanted "2 discus with you". That mom turned out to be the wife of Deputy Minister at China's Ministry of Education! What followed was a mother's determination to expose this fraud and she started telling her story to the PSB, SAFEA, CFTU, and China Scam Patrol. The hunt for fake teachers began and the PSB increased their rewards for "illegal migrant workers" from 5,000 rmb to 10,000 rmb in 2016 and then again to 15,000 rmb in 2017. They also gave the local beat cops a 1,000 rmb reward for every fake teacher they took into custody. That got their attention since they only earn 5,000 a month on average. 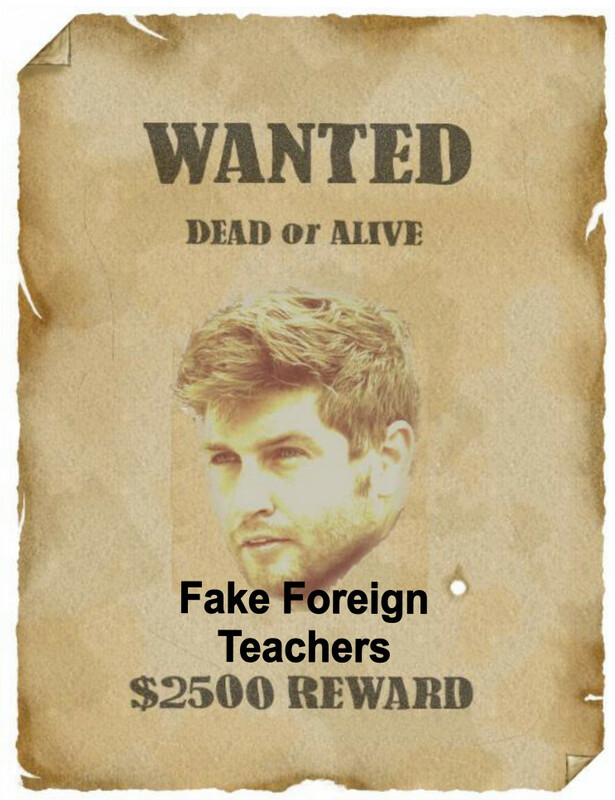 With the money motivation, more and more fake teachers were being tracked down and even TAs (teacher aides) who work in the schools began getting in on the act by anonymously reporting the impostor teachers through relatives who would then collect the reward monies for them. TAs that normally earn 4,000 rmb a month suddenly began driving cars to work instead of bicycles. Finally, the foreigners in China saw all the money being made simply by snitching on illegal immigrant workers - including their fellow expats! Just turning in one fake teacher paid their rent for three months, and now the snowball is starting to roll downhill. The Chinese government recently passed the "False Documents Law" which was original to be used to stop the export of counterfeit goods since fake shipping manifests and customs documents have to be fabricated. But the creative cops are using the law to arrest and jail foreigners caught using fake diplomas and TEFL certificates, and of course to collect their bonus moneys. This writer met with a new "Expat Bounty Club" in Shanghai last week where a group of TEFL teachers hired a hacker to get into the emails of a fairly well-known recruiter and now are visiting the pubs and school parking lots of 300+ schools in Shanghai snapping photos of the teachers to give to the PSB. "Marlene" (not her real name as she admitted) says the club of five pool and split the reward moneys and they will never teach another English class. This week the group in on vacation in Fiji waiting for the school year to begin in September, so they can "go back to work." SAFEA's assistant administrator in Beijing, Mrs. Song admitted six months ago that "there are about 10,000 fake foreign teachers working in China illegally". But with the focus now switching to the recruiters who lure these fake teachers into China, it is easy to see how the jails of China will soon have more foreign guests than ever before. All this makes me wonder how many foreign free-lancers are also now becoming the new bounty hunters of China?